A generation has grown up with Melina Marchetta’s writing since she debuted with her impeccable young adult novel Looking for Alibrandi in 1992. 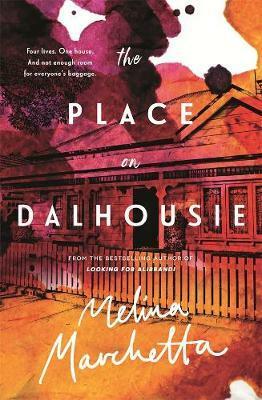 As one of that generation, it’s a joy to read The Place on Dalhousie and witness Marchetta move into contemporary adult fiction with all her sparkling dialogue, brilliant characterisation and messy but deeply human relationships. When Rosie Gennaro meets Jimmy Hailler in Queensland after forty days and forty nights of rain, she thinks it’s all a bit biblical – the small town is flooding, and Jimmy looks a bit like Jesus in orange SES overalls. Both Rosie and Jimmy are unmoored: Rosie has run away from Sydney, numb with grief over her father’s death a year ago, and her mother’s death four years before that, while Jimmy drifts in and out of other people’s lives but never seems to fully inhabit his own. Two years after their brief encounter, Rosie storms back into Sydney to lay claim to the house on Dalhousie that was her father’s life’s work, and which is now occupied by Martha, the woman Rosie’s dad remarried, who is struggling with her own riptide of grief. When Jimmy re-enters Rosie’s life, these three souls – all still hurting and raw – warily learn to make space for each other in their lives. With The Place on Dalhousie, Marchetta proves she is one of our best writers of contemporary human drama and one of Australia’s finest crafters of character and dialogue. Her characters are smart, tough and vulnerable. They have that lived-in feeling where they seem to exist in this world even after you close the pages of the book. To some extent, that is because this is a sequel of sorts. Those familiar with Marchetta’s previous novels Saving Francesca and The Piper’s Son will recognise Jimmy and his high-school friends, whose easy friendship and mid-twenties growing pains will thrill and delight fans of those books. That said, this is also a strong, standalone that readers new to Marchetta’s writing will love for its warmth and compassion. Marchetta’s work radiates hope, emphasising the ability of people to connect and to change themselves and the lives of others in true and meaningful ways. There is nothing glib about these connections; all her characters’ victories feel hard-won and earned, and they are all the more satisfying for it. This is a book about grief, the redeeming love of family and friends, and the potential for second chances. In a world that can feel dark and cynical, this beautiful book is the perfect antidote.